Last year I went to a conference on Error and Print Culture, where I was very taken with a certain type of early modern print error. If the type isn’t set tightly enough then, when it comes to inking, the sticky ink on the inking balls can pull a letter up out of the galleys and spill it onto the floor. And sometimes the hurried pressman, reinserting the letter without looking too closely at the context, might replace it upside-down by mistake. So what was supposed to be a u might appear as an n: the word love (or loue), for example, might become lone; or a p might become d (map becomes mad), and so on. Thus, Shakespeare editors face the challenge of deciding whether Othello casts his pearl away like the base Indean or the base Judean. So with my Oulipo head on, I wanted to see just how much of an editorial problem this might be: what would be the implications if we found ourselves in a state of radical doubt about the printers’ ability to get letters the right way up? This was the plan: first I went online and found a dictionary – in this case a Shakespeare wordlist which runs to 20,000 or so items; then I wrote a computer program which takes each of these words and tries flipping its letters upside-down to see if you end up with another valid word from the same dictionary. You can set which flippable pairs you want to allow each time you run the program, but the options I coded for were p and d, b and q, u and n, a and e, and f and s (the long s shape in early printing can easily by mistaken for an f at the compositing stage). If you allow for all of these, you get a surprisingly large number of potentially ambiguous words: about 600 of them. A lot of them are only ambiguous within quite a narrow semantic field: Kentishman vs Kentishmen, for example. But some are more fun: fancy vs saucy, or the ultra-slippery pan, pen, peu, dan, den. The last thing to do was to try to write something that used as many of these upside-down words as possible in order to be maximally ambiguous. Here’s what I’ve come up with so far: a pair of poems. They’re called ‘Sweat Themes’, after Spencer’s famous line (often incorrectly set as ‘Sweet Thames’), but also because there seems to be a lot of sweating going on in both of them. This barely scratches the surface of the corpus of flippable words. What about pigs and digs; dies vs pies; the wise wife who’s weeping or possibly weeding because she’s dowerless or maybe powerless. There are fishy terms: carp (card), fin (sin), sole (sola), dace (pace), bass (bess), battered (bettered); boozy ones – fancy ales like becks become saucy, alas, like backs; and semantic leaps from common to proper nouns: orphans to orpheus; are you in denial or in daniel? For the radical doubter, even quite a straightforward document opens onto a world of instability, all Surrealist imagery and Modernist grammar. 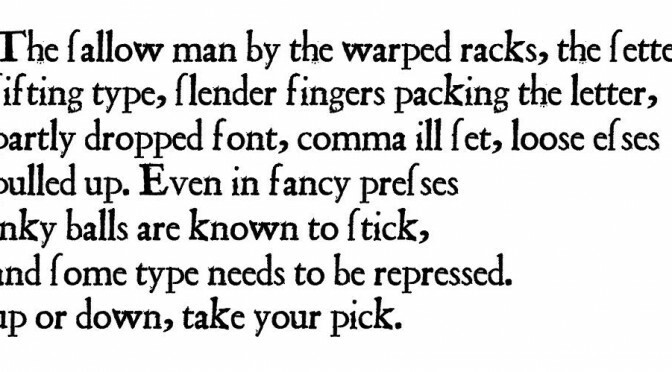 And all because of carelessness in the printshop: too-casual typesetting or getting too heavy-handed with the ink dabber. As Boney M so memorably meant to say, Oh, those ruffians!